Please note: If you have any kind of ongoing activity, even if you are only in the team finder and no tournament or ladder, you cannot remove your game account. Double check that you don't have any ongoing activities before trying to remove a game account. If you'd like to change your Steam account for CS:GO, simply click on the name in the left sidebar navigation. Click on REMOVE and your current account will be disconnected from Challengermode. After that you can add another account. 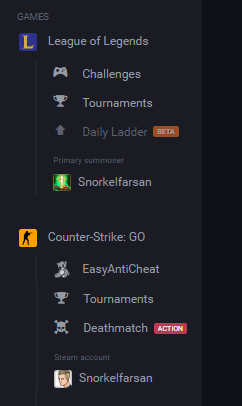 Note that it's not possible to add a Steam account that has been previously connected to another Challengermode user. If you want to change or add another League of Legends Summoner, click on the primary Summoner in the left sidebar navigation. Note that you can only have ONE Summoner from each League of Legends region. Currently, EUW or EUNE are supported. The primary Summoner is chosen automatically based on which has the highest rank or level.